You found it! I was skeptical that it could be done, but a commenter named “Peeper” found the link where I could find that song that I was raving about. The MP3 is available here on Amazon for $0.99! Needless to say, I’ve listened to it about a hundred times since last Friday. Thank you! Yaya took him back to her house, the rabbit riding shotgun all the way down to Houston. I have to admit, I miss the Sisyphean drama that unfolded hourly when he was here (described a bit in #2 here). Yaya would get the rabbit fixed up just right, then one of my little girls would bounce up and put a bonnet on him or take his little basket away. 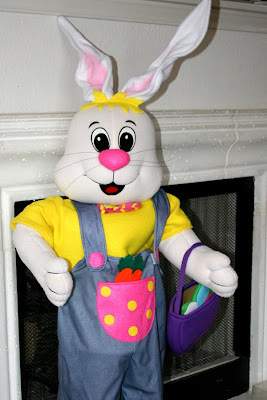 Yaya would react with shock — utter, complete shock — that the toddlers weren’t following her stern admonishment to not touch the brightly-colored, life-sized toy rabbit in the middle of the living room. She’d get him all fixed up again…and then my four-year-old son would come racing up and see how many times he could rapid-fire karate chop the rabbit before Yaya yanked him away. She’d get the rabbit all fixed up again and then…well, you get the idea. I have discovered the awesomeness that is quinoa. When some friends of mine showed it to me after discovering it at their all-natural foods co-op, my initial reaction was, “You can’t fool me, hippies! That’s birdseed!” Boy, was I wrong. A friend used it in a dinner she made for us a couple weeks ago and, as it turns out, this stuff is delicious! It’s also easy to cook, super healthy and actually tastes better than rice. This is going to be a new staple food for us. I found out where you can get meat for your rattlesnake recipes: the Rattlesnake Roundup in Sweetwater, TX! That’s right, just for fun you can go out and try to encounter rattlesnakes, and then go to the festival where there’s plenty of deep-fried snake and they even crown a Miss Snakecharmer (their schedule of events is amazingly detailed — who knew that a rattlesnake roundup was so involved?). If it weren’t so far I away I would definitely have to go check that out. 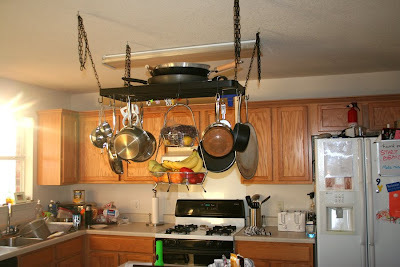 A hanging pot rack! My birthday was in January but we just now got it all set up (“we” meaning “my husband did it while I took a nap”). I cannot tell you how life-changing it is not to have to deal with POT AVALANCHE every single time I go to cook something. From a PR email I just got: tonight (Friday) EWTN is going to have an interview with a real-life exorcist. It’ll be on their show The World Over at 8:00 ET. Anyway, the interview does sound interesting. I’ll be tuning in. « Why did Jesus have to die for our sins? Congrats on discovering quinoa –it rocks! It’s also great for breakfast, in bean salads and even dessert — there’s a great recipe for orange dessert quinoa in Beth Hensperger’s “The Ultimate Rice Cooker Cookbook”. Also, amaranth is another terrific grain — tasty and easy to make. PS: if you don’t already have a rice cooker, consider getting one — it’s one the things I couldn’t do without in my kitchen. Simplifies life unbelievably! Your adventures with Giant Rabbit have cracked me up. I’m so sad he/she is gone. I love the pot rack. What a cool birthday present! I wish I shared your enthusiasm for quinoa, we just didn’t like it. Thanks for hosting and have a very blessed Holy Week and Easter. A few years ago quinoa was a staple in our house too, until I got sick of the mess. My kids always seemed to manage getting it all over the kitchen. Now that I have a new toddler I’m not sure I want to reintroduce it. It is good though. I’m scared to check out that exorcism link. Who knew? I have a brother-in-law who did not like the children touching the Christmas tree. It was a lot of fun staying in his house for 3 days at Christmas time. 2. I think Yaya needs to have a tradition of taking an "untouchable" life-size holiday decoration each time she visits. 6. The whole thing is somewhat scary to me, but I think it's legit. Evil exists. In a major way. #3 convinced me. I have to try quinoa now! Thanks for the tip on the quinoa. I recently purchased the book “Eat This Not That” and they suggested eating this. I had never heard of it but now I think we’ll give it a try. I like the taste of quinoa, and it’s nutritionally awesome, but when I bought some the instructions say you have to rinse it before cooking, and I found that so annoying that I have not cooked any more since! (I have, however, been using it as an ingredient in gerbil chow.) Do you have any suggestions for easy rinsing?? Neat quick takes! I laughed when I read “shower of pots” because I know the feeling! A new stove just moved into our house yesterday and it’s so awesome! I’ll have to check out quinoa. I’m always looking for new things to try out. The idea of exorcism has always freaked me out a little. It’s a good dose of reality for me though, and a reminder of what’s really out there. Thanks for hosting us. Cheers from Nebraska! Hard to believe that Holy Week arrived so quickly! Your Pot rack is lovely…I have one mounted on the wall above my oven (we have a double wall oven…came with the house)…I LOVE the rack! My Husband is registered to go to “An Evening with an Exorcist” with Raymond Arroyo…in South Jersey…I think it will be amazing! 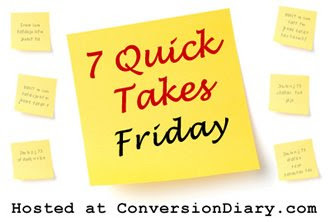 I think I’m taking off from blogging/ even reading for Holy Week…could be the hardest fast I’ve ever done! My only experience with quinoa is in a soup recipe–but it’s a very good soup! I rinse it by putting it in a (fine mesh) strainer and running cold water gently over it. (Gently, so it doesn’t wash the grains out of the strainer!) Let it drain a bit, then cook it however, and rinse the strainer before it dries on. Oooh, I just got a potrack at Ikea too and I love it! Especially since I’m pregnant, I cook all day long it seems, and my pots WERE underneath the counter next to the stove. So glad I don’t have to bend over so much! This is my first time participating, and it was so fun! ‘Becca – There’s no real need to rinse quinoa. They always say to rinse rice and lentils, too, but we never do, and we’ve never yet had a problem because of it. I think you’ll be okay just cooking it up. And isn’t it tasty? I love watching the little tails unfurl. 3. Quinoa is super good! My friend Bethany shared some recipes a couple months back in this post and this one. In the old days you had to rinse quinoa because the grain has a natural coating on it (a kind of natural pesticide) that is soapy and bitter tasting. But, nowdays, that coating is already removed, so the grain you buy is good to go. I never rinse it and have never had any problems. If you feel you must rinse it, another way to do it is to put it in a bowl and swish the water around with your hands and drain it using a fine mesh strainer. the part about the cats was not as creepy as the part about the different voices she was speaking in. truly, a good reminder that satan is watching and waiting. How horrible that you’re promoting something as sick and disgusting as a rattlesnake roundup. Being pro-life apparently doesn’t extend to any other of God’s creatures than humans. Maybe next week you can print some nice photos of dogs being slaughtered for meat and some nice cat recipes. Thank you, Jennifer, for linking to one of the scariest things I’ve read in a while. I should preface this comment by saying that Unsolved Mysteries has the potential to seriously freak me out, even some episodes of Law and Order and I NEVER, NEVER, NEVER watch scary movies or read creepy stuff (Dean Koontz -no thanks) because I am the world’s biggest chicken. So, my husband is out of town, the kids are asleep and the house is mostly dark and I clicked on over there knowing I shouldn’t do it and YIKES. Thanks again for hosting. I love the pot rack, and thanks for the info on Raymond’s next interview. Sounds intersting. Hey – about the giant Easter Bunny… So does he (the EB) come to your house and fill the Easter baskets? I’m just wondering what other holy parents do at Easter so that the excitement is a little less about bunnys and candy and a lot more about the Resurrected Christ. My husband and I are wanting to not have the Easter Bunny at all but I’m kinda wondering what that would look like. Any ideas? How do you do it? How horrible that you’re promoting something as sick and disgusting as a rattlesnake roundup. Being pro-life apparently doesn’t extend to any other of God’s creatures than humans. “Pro-life” as a term is generally taken to refer to being against the killing of humans. While you’re perfectly welcome to like reptiles in general and rattlesnakes in particular, most people draw the line somewhere. I know few people who are pro-cockroach and none who are pro-ebola virus. Maybe next week you can print some nice photos of dogs being slaughtered for meat and some nice cat recipes. I so love my pot rack too!!! I had to look and look for a small one for my space, but once I found it I fell in love. Happy Easter week and welcome, welcome to the 150,000 candidates and catechumens joining the fam here in the US next week. I can’t wait!!! Not on topic for this week’s takes, I know, but it’s just so very exciting!!!! Frankly, that giant rabbit is SCARY. Please, doting grandmothers, I’m begging you for the sake of the one sensitive child in your life who that life sized bunny (or doll, or clown, or whatever!) will give nightmares to for the rest of their lives (i.e. your grandchild like ME), do not get it. It is NOT CUTE. Remember, yaya thought it was okay for the children to play with scorpions — do you really trust her judgement? And your other non-sensitive grandchildren won’t like the giant bunny all that much — they just pretend to like it a lot to make you happy because they love you. Just spend more time with them or take them to the park. And really, think about it.. where will you store a life sized bunny? Do you really have room? Just trying to do a public service. I just started reading The Rite today, about exorcism in the church. I know I should be scared, but mostly I find it FASCINATING. I tried quinoa and I wasn’t particularly impressed. Am I cooking it wrong or something? It was chewier than brown rice and I didn’t think its flavor was as good as brown rice. Quinoa lovers of the world, can you tell me what I’m doing wrong? THANK YOU SOOO MUCH for posting the link to the song that you raved about. I hadn’t read your original post about it, but on your recommendation, I did download it and now I CANNOT stop listening to it! I love it. So, got any other good songs/albums/recordings to recommend? Have a blessed Easter. You have surely blessed me. What I want to know is : are the snakes treated humanely before they are killed ? I once saw coverage of such a ’roundup’ in which live snakes were simply dumped in open pens. The snakes were stacked on top of each other, with no shelter from the mid-day sun and no water. I have to say thankyou twice. First for putting me onto quinoa. amazing stuff. My fussy 7 year old even likes it too and I would never have tried it if it were not for you! Secondly, how did I forget I have a pot rack? My stepfather made me one and, I don’t know why, but several moves that saw us not put it up made me forget about it. I live with pot and pan hell and then I saw you photo. And went, that looks so funky and practical. I love those things. I wish I had … hang on, I have a really nice one…. Guess what hubby will be doing tomorrow!